Jennifer Loy interviews Frank O’Donnell on China’s OBOR/BRI and the motivations behind it. Frank is a Stanton Nuclear Security Junior Faculty Fellow, International Security Program/Project on Managing the Atom. 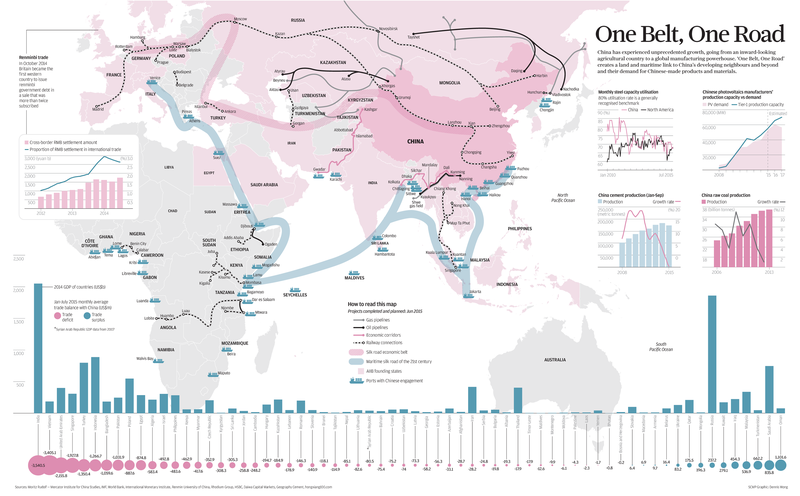 In a simple way, can you explain China’s One Belt One Road (OBOR)/Belt Road Initiative (BRI)? OBOR aims to fulfil multiple geopolitical objectives for China. The first is as a statement and demonstration of global influence. The Pakistan-specific element of OBOR alone, entitled China-Pakistan Economic Cooperation (CPEC), features an infrastructure loan to the Pakistan government of $46bn. This sum, as only one part of the overall OBOR initiative, has been estimated to be worth more than the total devoted to the Marshall Plan when converted into today’s dollar equivalents. The principal land corridor branch creates a land transport and infrastructure route from Chinese east coast cities through Xinjiang. It then enters Central Asia, Iran, Turkey and Russia, and terminates in Western Europe, China can improve its access to crucial energy resources in these states while elevating its influence in their politics. This will also serve to economically develop and further lock Xinjiang into the Chinese economic system – this province has been one the poorest and most isolated within China, and suffers from continuing Muslim extremism and brutal PLA Army crackdowns. A branch of this corridor will also extend from Kashgar in Xinjiang through to the Gwadar port in Balochistan in southwestern Pakistan, sitting on the Arabian Sea. Both of these branches enable China to create viable alternative energy and other supply routes should the Malacca Strait become blocked for some reason. This second Pakistan branch also allows China to provide the aforementioned huge economic stimulus to Pakistan, to enable it to remain economically viable and also to upgrade its road and rail infrastructure. The latter is of relevance to Pakistan’s military, as these new networks can easily be commandeered for improved military logistics (for example surging Pakistani forces toward the Indian border) in a crisis. As such, this second corridor – CPEC – enables Pakistan to remain militarily competitive with India, a core long-term foreign policy goal of Beijing. The second major component of OBOR is the Maritime Silk Route. This intends to start from Chinese east coast ports and move through Hanoi, Jakarta, Singapore, Kuala Lumpur, Sri Lanka, the Maldives, East African port cities such as Mombasa and Dijibouti, before crossing through the Suez Canal to European Mediterranean ports. The Gwadar port in Pakistan could easily be added to this network. This Route extends Chinese political and economic influence to these states through port construction projects and associated generous loans. Building this network helps justify and regularize a growing Chinese military naval presence across the Indian Ocean. Many of these ports, such as Gwadar and Djibouti, are intended to be used for both Chinese military and commercial naval traffic. The third major component of OBOR is ultimately domestic. While economically developing Xinjiang, the initiative more broadly aims to address a major long-term economic problem for China: its oversupply of steel, cement and other similar factories, with insufficient demand within China for their products. This is part of China’s general problem of its previous investment-heavy economic model, which relied upon international and domestic capital to invest in new factories to increase supply. While it is attempting to move toward more reliance upon domestic consumption as a driver of economic growth, all of these rail, road, energy, and port infrastructure projects create international demand for the products of these existing factories, and thus avoids the politically and economically difficult challenge for Beijing of overseeing their shuttering and deliberate contraction of this sector of the economy. Do you believe Xi Jinping’s intentions are truly economic and almost nation-building, or do you think there are military motives as well? There are clear military motives to OBOR. I have already pointed out their implications for Pakistan’s military competition with India, and for China’s naval ambitions. More subtly, the generous infrastructure projects and loans offered to OBOR member states are partly offered to bring certain of these states (such as Sri Lanka, Maldives, Nepal) more into China’s sphere of influence. This has obvious military implications in terms of threatening the continued ability of the United States to assemble and maintain a loose coalition of regional states that oppose the aggressive nature of China’s naval expansion. According to an excellent new report, titled “Harbored Ambitions,” on Chinese perspectives and management of the Maritime Silk Road project, they consistently view these projects as having greater strategic/military than economic importance. The BRI is an incredible endeavor, a modern Silk Road. How is the Chinese government funding this project? How do the Chinese people view such an extensive project? It is difficult to accurately determine the level and quality of support for the initiative among the mass public. However, a useful recent article by Michael Swaine indicates that China’s political and strategic elite express consistent positive support for OBOR, but occasionally raise reasonable concerns relating to the sheer scale of the project and the accordant consequences of failure. BRI projects would truly benefit the host nation if locals are employed. Is this part of the BRI? The majority of OBOR contracts go to Chinese state-owned construction and engineering enterprises who send Chinese workers and engineers to the host country to do the work. See here and the “Harbored Ambitions” report for details of this. This system permits maximum Chinese government control over the political and financial aspects of each project. In effect, it means that most projects take the form of a Chinese state-owned bank lending a recipient state a large sum of money with significant interest to pay for the project, which then goes directly to a Chinese state-owned construction or engineering firm that employs Chinese nationals. The Chinese firm may partner with a local firm from the recipient country, but it remains the lead contractor and in charge of the project. Are the free-trade agreements China recently made in South Asia also part of the BRI or are they separate? They are formally separate, but support the overarching Chinese effort to build economic and thus strategic influence within these countries, and lower political and economic barriers within these countries toward this end. In Xi Jinping’s first address to the UN in 2013, he stressed, “We should build partnerships in which countries treat each other as equals, engage in mutual consultation, and show mutual understanding.” I feel this does not prove true today with Sino-Indian relations, especially as China is gaining influence in South Asia. What can you say to this in terms of the BRI? I agree, and this is also shown by the nature of the OBOR projects I have discussed above. This demonstrates that this rhetoric by Xi Jinping is indeed just rhetoric. India appears to be losing influence in Nepal, Sri Lanka, and the Maldives. What do they need to do to regain this, or should they wait and see how the BRI aids the region? Indian diplomats should warn their counterparts in these states of the dangers of agreeing direct OBOR projects, as evidenced by the recent Sri Lankan concession of the Hambantota port to China on a 99-year lease because it could not meet the payments of its loan agreement with China. India should, as far as is fiscally possible, offer its own competing economic development projects within these states that grant more of the contract to construction and engineering firms within those states, and on better loan terms. It should also seek to leverage the AIIB and New Development Bank to provide general and project-specific development loans to these states, to reduce their demand for the kinds of projects China would offer. Finally, given that it is now in greater direct competition for influence in these states with China, self-defeating Indian policies that only reduce its influence, such as the trade blockade with Nepal in 2015-16, should not be repeated (see here for the background). What benefit(s) will India receive from the BRI? What does it need to do to benefit from it? Does Indian Prime Minister Modi even want Chinese investment? Modi wants Chinese investment to help build Indian infrastructure, but is far more comfortable receiving it through the avenue of AIIB project funding, with the AIIB authorizing $1.5 billion of funding in 2018. This will largely be because India has a position on the AIIB board and ownership stake, and thus a greater degree of control in the terms of the loan. India actively opposes both the OBOR project and the idea of receiving direct Chinese funding through an OBOR-type agreement. New Delhi is also aware that withholding its support and cooperation with the broader OBOR network is a major point of leverage it has over Beijing. Scholars and analysts I spoke to in Beijing in January and February were well aware of the importance of Indian participation for the success of OBOR and that India had accordant leverage over China in continuing to refuse to participate. Xi described the BRI as a “win-win” for the nations involved. I understand it is too soon to truly tell. Regardless, what needs to happen for it to be a “win-win” for those involved? The OBOR projects would have to be structured as loans at low interest rates, if not grants, to support infrastructure development in the recipient countries, with the majority of contracts going to firms in those countries. There would need to be little military relevance to these projects, for example in the nature of port design. In such a way, the recipient countries would be able to modernise their infrastructure, while China would accrue important soft power benefits and be able to build a more positive image for itself in global politics and within the societies of the recipient countries. Jennifer is a Research Associate for Nepal Matters for America, Washington DC.